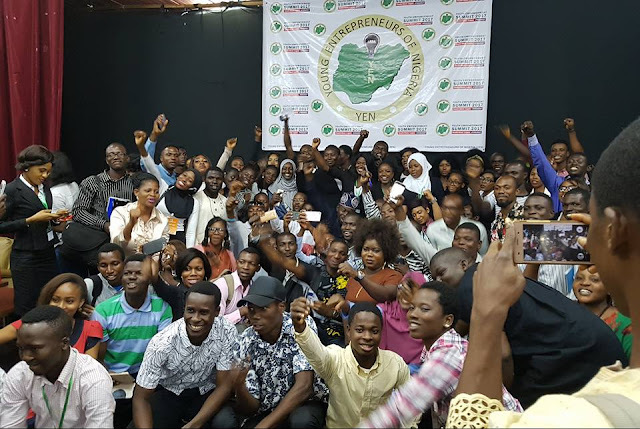 The Youth Empowerment Summit 2017 (YES2017) South-West Lagos held 28th September, 2017 at the Banquet Hall, National Theatre, Iganmu, Lagos was certainly a success, with multitudes of delegates in attendance across the entire South-West region of Nigeria with more than 10 high profile speakers. At the event, His Imperial Majesty, Ooni Adeyeye Enitan Babatunde Ogumwusi, Ojaja II, Ooni of Ife officially declared YES2017 opened and gave his blessings. He lauded the initiative and expressed his joy for the timely intervention of the project. Ooni of Ife who is also the Chief Host of YES2017 spoke to delegates, speakers and exhibitors through a live broadcast and encouraged the youths to use the opportunity to realize the unmatched potentials in building their future and contribute to the development of the nation. Speakers at YES2017 South-West Lagos include Mr Olukayode Pitan, MD/CEO Bank of Industry, Mrs. Ibukun Awosika, Chairman, First Bank Plc, Princess Ronke, Founder, Fashion Week Africa and London, Mr. Chris Kohol, National President, YEN, Mr. Dipo Adesina, President YEN-USA Diaspora Chapter, Alhaji Ahmed Ojikutu, CAPDAN President among others. The speakers stressed the need for innovation in other to cope with today’s world. They opened up top secrets of successful world class entrepreneurs tailored towards arming delegates with novel ideas for entrepreneurship. Speaking to a pool of delegates at the summit, Mr. Chris Kohol, National President, YEN said, "One of the ways of eradicating unemployment is not by more government jobs but by raising new entrepreneurs". He urged everyone to think production and think entrepreneurship to get our lives moving forward. Emphasizing on the need to eradicate the increased dependence of many Nigerian graduates on government jobs, Alhaji Ahmed Ojikutu, CAPDAN President reiterated that innovation is the lee way to making a living in a time as this. He said "Innovation is adding value to what others have done. Delegates were elated by the speakers as their excitement and enthusiasm filled the arena. 1. That Federal and State governments should reduce the cumbersome procedures of accessing finances for young startups. This will motivate and promote entrepreneurship in the country. 2. That technical colleges be revamped and more vocational training programs should be encouraged. 3. That tax holidays be given to young start up entrepreneurs from the ages 18 - 30 to boost massive involvement of young Nigerians in entrepreneurship. 4. That agencies such as SON, NAFDAC, CAC and more alike be involved in encouraging young start up entrepreneurs to do more for the country thereby making registration process less cumbersome for young start ups. 5. That South-Western State government and other relevant agencies should collaborate to empower more youths in their regions. 6. That Government, Stake holders and relevant agencies should work together to create a viable platform where Nigerian youths can convert their energy from “Area Boism” to productive enterprise thereby reducing the increased army of unemployed youths in the country. 7. That government should support and encourage organizations that champion the course of youth entrepreneurship development. These and other recommendations were highlighted in the summit. Recall that YES2017 is scheduled to hold in the six geo-political zones of Nigeria from September 28 through November 2nd. Hence, YES2017 tour moves to other regions having successfully concluded the South-West region. Other expected locations for the tour include: Port Harcourt, Enugu, Kaduna, Yola and Abuja. The National President, Mr. Chris Kohol assures the general public of YEN'S commitment host YES2017 in the five other locations.